Connor Raines (right front), 11, leads the charge into the coool waters at Ottawa Metro Park to begin the Lima YMCA/Kewpee Triathlon/Duathlon Sunday. Noah Fisher gets ready to begin the bicycle portion of the Lima YMCA/Kewpee Triathlon/Duathlon held at Ottawa Metro Park Sunday. Molly Scott has a little trouble getting onto her bike during the Lima YMCA/Kewpee Triathlon/Duathlon at Ottawa Metro Pari Sunday. Josh Kuhlman crosses the finish line in first place at th eLima YMCA/Kewpee Triathlon/Duathlon held at Ottawa Metro Park Sunday. 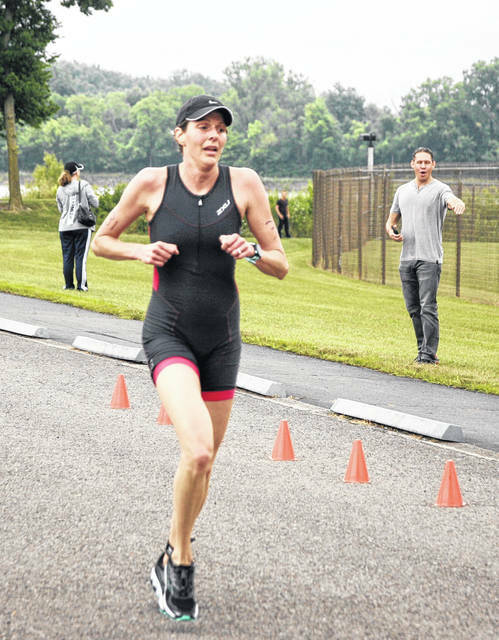 Abbie Meyers was the top female in the Lima YMCA/Kewpee Triathlon/Duathlon held at Ottawa Metro Park Sunday. 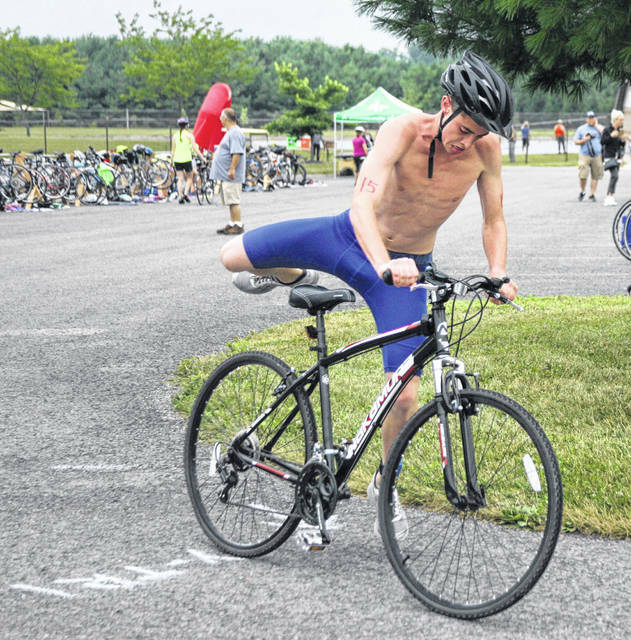 Josh Kuhlman admits winning this year’s Kewpee/Lima YMCA Triathlon held at the Ottawa Metro Park was not as exciting as capturing his first one last year, but the 17-year-old from Shawnee admitted it was just as sweet. Kuhlman raced to a first place time of 1:10.09. Taking second place was Jonathen Robey with a time of 1:11.47.1 and Keith Ranly rounded out the top three with a time of 1:14.34.8. “It feels a little bit different because last year’s was the first time so I think it meant more but it feels great,” Kuhlman said. The triathlon began with a 500-yard swim, followed by a 15-mile bike run and concluded with a 5k run. With a slightly new design for the course and the finish line positioned in a different spot, Kuhlman lost some seconds when he came off the bicycle and their was some miscommunication on which direction to go to the beginning of the 5k start but was quickly pointed to the path. Despite the minor setback, Kuhlman said he felt control on the bike and once he hit the 5k he added that he felt confident he could win the event. By winning it a second, time Kuhlman, who had a brother and sister win the event, keeps up a family tradition. “It keeps the family name going,” Kuhlman said. Abbie Meyers, who as runner-up last year, took top honors in the female division. Meyers garnered top honors with a time of 1:19.44.9. Kathleen Colvin grab second with a run of 1:25.04.8 and Kristy Birkemeier came in with a time of 1:28.24.8 to snare third place. Meyers added that she tried to keep a fast pace and sprint to the end. She said she swam with a fellow competitor and then entered the bicycle portion pretty much alone and then began to pull away during the 5K. In addition to the triathlon, a duathlon, consisting on the 15-mile bike run and the 5K, was also run and Sean Martin was the top finisher with a time of 1:15.54.1. Anthony Tegenkamp placed second with a time of 1:30.27.4 and Dylan Arhert was third with a time of 1:34.44.1. In the team division, Briggs finished first in the triathlon with a time of 1:17.45.2 and Trifecta was second with a time of 1:37.17.1 and NEMO was third with a time of 1:59.50.3. Kinworthy won the dualthon team race with a time of 1:39.42.8. C.J. Hernandez, YMCA Health and Wellness director and one of the organizers of the event, said it was another successful triathlon and the rain held off to add to some ideal conditions for racing. Numbers hovered around the same from previous years and Hernandez said they are looking at future options to better promote the event. 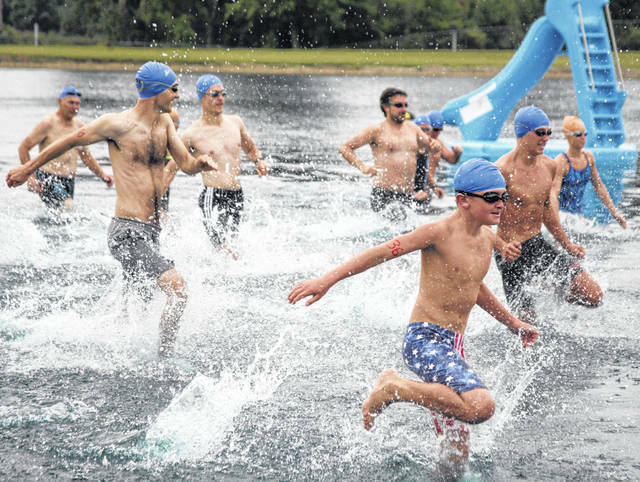 https://www.limaohio.com/wp-content/uploads/sites/54/2018/07/web1_Tri2.jpgConnor Raines (right front), 11, leads the charge into the coool waters at Ottawa Metro Park to begin the Lima YMCA/Kewpee Triathlon/Duathlon Sunday. https://www.limaohio.com/wp-content/uploads/sites/54/2018/07/web1_Tri3.jpgNoah Fisher gets ready to begin the bicycle portion of the Lima YMCA/Kewpee Triathlon/Duathlon held at Ottawa Metro Park Sunday. 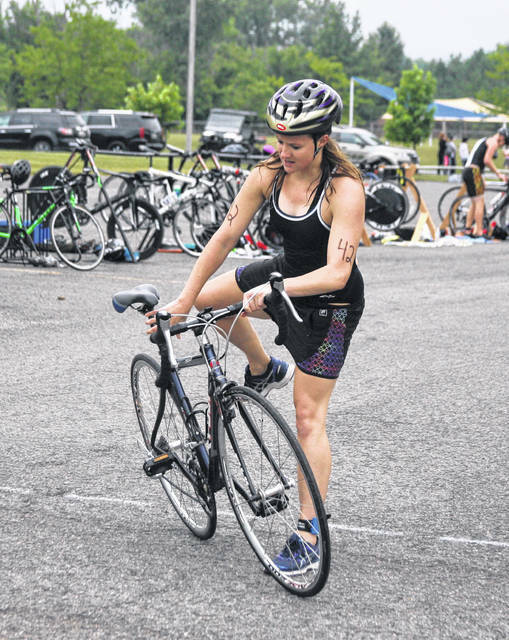 https://www.limaohio.com/wp-content/uploads/sites/54/2018/07/web1_Tri5Mollyscott.jpgMolly Scott has a little trouble getting onto her bike during the Lima YMCA/Kewpee Triathlon/Duathlon at Ottawa Metro Pari Sunday. 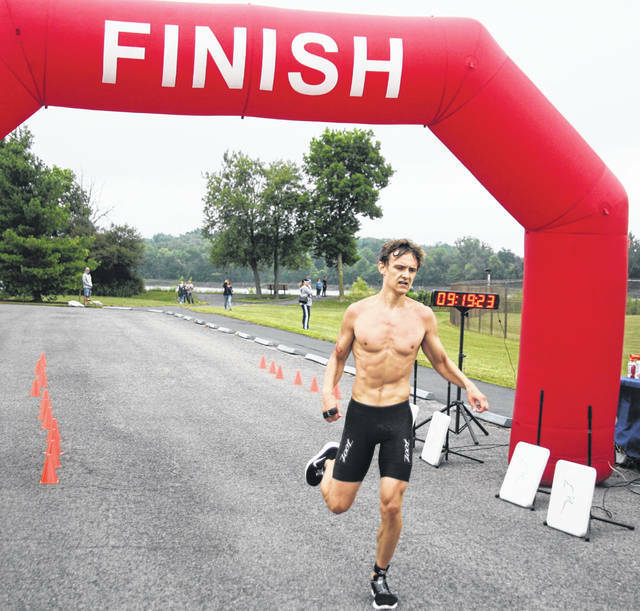 https://www.limaohio.com/wp-content/uploads/sites/54/2018/07/web1_Tri6.jpgJosh Kuhlman crosses the finish line in first place at th eLima YMCA/Kewpee Triathlon/Duathlon held at Ottawa Metro Park Sunday. https://www.limaohio.com/wp-content/uploads/sites/54/2018/07/web1_Tri8.jpgAbbie Meyers was the top female in the Lima YMCA/Kewpee Triathlon/Duathlon held at Ottawa Metro Park Sunday.